As I was fishing underwear from my washing machine the other morning, I experienced a mild case of panic. Like Lewis Carroll's White Rabbit I found myself muttering, "I'm late! I'm late! For a very important date!" In the run up to my book being published next month I seem to be saying that a lot lately. The thing is, I've imposed all sort of deadlines on myself: get this done, get that done; start this, finish that. So many demands on my time and so few hours in which to accomplish all I've set myself to do. Phew! It's exhausting, especially when some of those tasks are mundane things like doing the laundry. Now that kind of stuff really tires me out - because I'll let you into a secret, a domestic goddess I am not. I am, however, a writer, and a writer needs a blog. Or so I've been told by several of my fellow scribblers over the years. Often. And yet I've resisted. The thing is, although I can happily work away at 90,000 word novel - through several drafts - the thought of maintaining a blog freaks me out. I mean - what do I have to write about, and, assuming I can find something to say, who'd want to read it? But to turn a phrase, 'faint novelist never won fair reader'. And so, as I untangled a heap of damp boxers and knickers, I decided to quieten my inner critic (not to mention that darned White Rabbit! ), and get that blog on the go. And here it is - my very first blog post. Hurrah! Unfurl the flags - I've finally taken the bloggerly plunge! About time too, I hear my friends say. I imagine they might even break out the fizz. Ah get over yourself, says you; you're only doing what thousands, if not millons, of people have done before you - and they're probably doing it much better than you ever will. I have two answers to that. One is you don't know my friends - any excuse for a glass or two of the bubbly stuff, eh Sarah B? And two is that although my blog writing might be never measure up to anyone else's - might even be pants - at least I've made a start. And that, dear reader, in my book, is worthy of a wee celebration. So, if you'll excuse me, I'm off to open a bottle of Scotland's finest...sparkling water! Cheerio until next time. Hi! I'm Christina Banach, author of Minty. Thanks for dropping by my website. Please take a look around. Here you'll find news and information about me and my books. If you have any questions do get in touch through my contact page. Thank you for visiting and happy reading! I was the 2017-2018 Scottish Book Trust Author in Residence at Knightsridge Primary School, Livingston. Many thanks to the SBT for for affording me the opportunity to share my love of writing and reading with such an inspiring school. "This is a thought provoking debut novel about love, loss and the importance of family…A compelling and ultimately heart-warming story." "Through Minty's eyes we see how family and friends are affected by bereavement. It deals with loss, love, friendship and over all, hope, resilience and strength of character. It's a haunting, eerie and beautiful read that will resonate with you for days after you read it. " 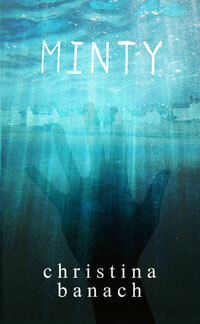 I'm very grateful to the Scottish Book Trust for featuring Minty as their Teen's Book of the Month. "What an amazing story! I could not put this book down!" "This is one of those gems that works for young adults and also the not so young...I read it in a single sitting - something I do not ordinarily do - except for a brief pause to compose myself before the final chapter, such was the intensity of emotion the book engenders. You must read this book..."
"Christina's stunning style of writing succeeded in bringing tears of joy and sadness to my eyes. For a first book being this good, it makes me wonder what is yet to come." I was thrilled to be part of the Edinburgh International Book Festival 2015 SCBWI panel event - How To Survive Being Published. It was a real privilege to have been invited. Thank you! Thank you to everyone who came to my plot and structure workshop in Edinburgh. I hope you had as much fun as I did. Thanks to Sheila Averbuch for this great write up of the day.